(1) These are the cartoon blanks that I am currently using because they fold to make a more attractive pamphlet: DOWNLOAD BY CLICKING HERE. You can also use the previous cartoon templates that I posted or you can make your own design. If you use my templates, be sure to write your name in the area with the license so that no one takes your work for commercial gain. (3) Email the two jpeg files to me. In the subject line write the phrase GREAT FVR CARTOON LIBRARY. Great idea, Mike. Thanks for doing this. One quick question just so I understand… I’m a bit lost on how you are building the online library of illustrated stories if we are to upload un-illustrated stories to participate. In other words, if I upload a non-illustrated story, how does it then become illustrated and posted for teachers to add to their FVR? Does another teacher have his/her students illustrate it, choose the best and share it back to you again? Just trying to follow…Thanks again! Yes, once you have submitted a non-illustrated cartoon then you will have access to the index. Whenever you are absent go ahead and download a dozen or so that you know your students will be able to understand. Say if you have 36 kids in a class, photocopy 3 sets of a dozen so that most kids will have a different story and tell them to spend the class reading and illustrating. Not a good lesson plan if there were a skilled teacher able to provide quality CI, but not bad for substitute plans! Hopefully one of three students is a decent artist and you can send me back 12 cartoons that are well-illustrated (and I will then post them to the website), or maybe you´ll only get 5. That is fine… eventually they will all get illustrated. Once the cartoons are illustrated, you have a ton of illustrated cartoons for a few minutes of FVR at the beginning of the period, AND your students have only read one out of every 12. Of course, you can submit a fully illustrated story. Sure! I am trying to make this as easy as possible for teachers and not steal valuable class time away from story asking. Frankly I do not think that spending class time illustrating is good practice. Kids need CI, lots of it, and a class burnt doodling is not rich with CI. However, if you ask an original story, using your kids creativity, that is fantastic CI. If you are later absent, need sub plans and are looking to maximize the delivery of CI when you are not there, then this plan is golden! Mike, this is an excellent idea. 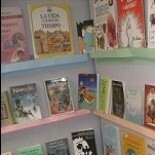 After listening to you on Teachers That Teach, I wrote about how easy it should be for [Latin] teachers to build their FVR library beginning with their own class stories (https://magisterp.com/2016/12/22/fvr-library-easier-than-you-think/)/ This project makes it even easier to start flooding students with input! Any reason these need to be handwritten, or as JPEGs? Would you accept them as PDFs with text already typed into the boxes? Of course I will accept anything original. My templates are just to make it easy… the ones I made myself have the text typed to leave more space for illustrating. I also feel fine about writing L1 explanations in the ample space I left underneath boxes because a word that has super common in my class may be unknown in a classroom down the hall. Michael, do I write the story in the front and in the back, or do I write it only in the front? I appreciate the work you do! Hat off to you!!! Do you have a blank template for your 8-piece–of-paper-16-with-folds version of the cuento stored somewhere? Or a 4-that-becomes-8 version? I have found this very hard to find via Google. However, those familiar with the A4 designation, making books apparently has something to do with that. Sorry. That was rushed and incoherent. I’m looking for a template for a larger-size book. It’s been hard to find on Google. The “A4” designation has something to do with it when printing, but I’m not sure what.